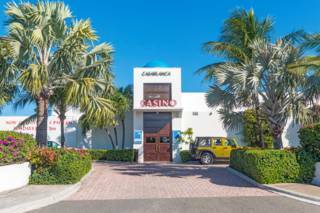 Casablanca Casino in Grace Bay on Providenciales. Caicos Royale Casino in Turtle Cove, Providenciales. Although the Turks and Caicos is rapidly gaining international recognition as a luxury tourism destination, the country doesn’t offer much in the way of gambling or casinos. There are none of the expansive mega casinos here that some other destinations such as Las Vegas, Aruba, and Puerto Rico have, instead only sporting a few small gambling establishments. The island of Providenciales attracts by far the greatest number of overnight visitors of any island in the Turks and Caicos, and consequently offers the largest selection of luxury resorts, restaurants, and nightlife. The country’s largest casino is Casablanca, which is located in the heart of the tourism district in Grace Bay on Providenciales. The casino features a white Moroccan-style building, so it’s hard to miss. Casablanca offers 85 slot machines and several live gaming tables, including baccarat, blackjack, poker, craps, and roulette. The casino also features a bar and lounge. Complimentary resort transport is offered. Many bars and restaurants on Providenciales, especially some of the establishments favoured by locals, also some slot machines onsite. Carib Gaming is the largest slot route operator in the Turks and Caicos, and maintains slot machines in dozens of locations in the country. A new resort project proposed for Providenciales is the expansive Turks Cay, stated to be built on the western side of Turtle Cove Marina on the site of the old Third Turtle Inn, which was the first hotel to be built on the island. The Turks Cay project is rumoured to include a large casino. Grand Turk currently does not have any operating casinos. The Grand Turk Resort and Casino was opened in 2014, yet closed shortly after. The site was located to the north of the Grand Turk Cruise Center, in an eye-catching faux pirate ship building. The minimum gambling age for visitors to the Turks and Caicos is 18. Residents of the Turks and Caicos, including belongers, permanent resident certificate holders, and work permit holders, must be a minimum of 21 years old and make at least $75,000 per year to legally gamble in the country. Gambling is also restricted to persons on the gambling premises. The Turks and Caicos has the dubious honour of being the birthplace of internet casinos! In 1995, Internet Casinos Inc. launched the world's first online casino, with 16 different games, and even access to the Indian National Lottery. However, other countries soon passed laws legalizing online gaming and as of today no online casinos are based in the Turks and Caicos. Casablanca is the island’s oldest casino and is found in the heart of the Grace Bay Region. Choose from slot machines, blackjack, poker and roulette.